Earth experiences a global hothouse period. Much of the polar ice caps have melted raising sea levels to the point where almost the entire planet was covered with water. Fortunately the presence of some tectonic plates and volcanic activity ensured a certain amount of dry land mass would be present for any gutsy lifeform to consider eking a living above water. Some readers might be wondering, why move into land? Good question. Perhaps some animals were tempted by the smogasbord of "all-you-can eat" insects that had already followed the plants onto land? We know plants had adapted to life above the water quite happily thanks to the Sun in providing light to help convert carbon dioxide into food using chlorophyll. The insects simply followed the plants for safety and food, which in term gave other animals the impetus to follow the insects into the new environment. Or more likely the real reason is because predators were forcing a number of animals to seek shelter and protection near the surface of the water and along the coastal regions where the predators had not yet adapted to the new environment. Much of Australia is covered by water. 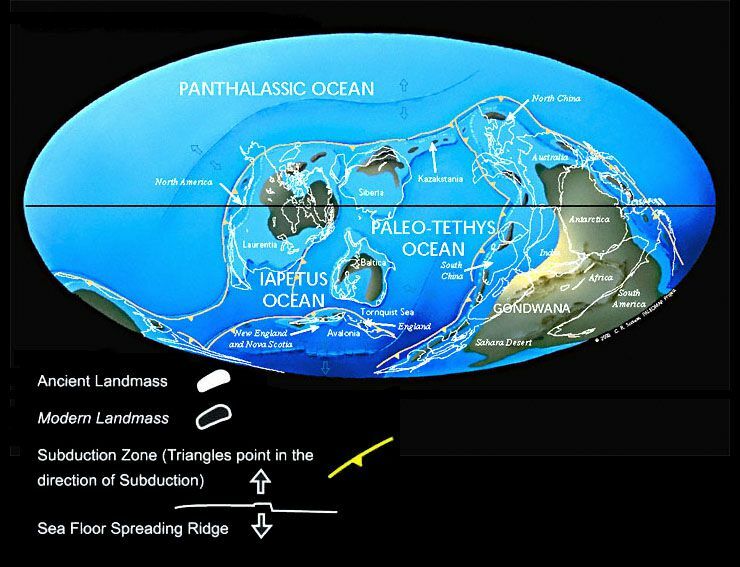 Earth in the Ordovician period around 458 million years ago. Image © 1997 Christopher R. Scotese. As of 2014, an updated map can be downloaded from the Colorado Plateau Geosystems, Inc. web site and created by Professor Ronald C. Blakey of Northern Arizona University (NAU). Plants have well and truly established themselves along the edges of mostly fresh water supplies and following the rivers back to their sources at lakes and near mountain ranges, and exit points long the coasts, so long as temperatures are warm enough and adequate minerals in the soil and carbon dioxide in the atmosphere with sunlight were in plentiful supply. New and larger forms of plants would appear at around this time as competition for the sunlight encouraged plants to evolve into new species. This was the time for the first known major extinction of animals and flora. Scientists estimate that around 85 per cent of all species and up to 60 per cent of genera had perished for whatever reason. Even the highly successful trilobites, the great scavengers of the seas and oceans, were not entirely flourishing at the end of this period. With no definitive evidence to prove what caused this extinction, some scientists have widened the scope of possibilities beyond the usual extensive volcanic activity through the break up of more tectonic plates or even an asteroid impact to suggest something in the universe may have influenced life on Earth. Today, scientists from the Astronomy Department at the University of Kansas are considering the possibility that somewhere between 6,000 and 10,000 light years away from the Earth there may have been a merging of two highly dense neutron stars or the sudden collapse of a very heavy star exceeding 20 times our Sun and the resulting star formed had directed one of its beams of energetic gamma rays emerging from the poles of the rapidly spinning star in the direction of the Earth. Even though these dangerous events  known as a gamma ray burst (or GRB)  do take place roughly 300,000 times per year somewhere in the visible universe, the highly directional and confined nature of the gamma ray beams makes it extremely rare to directly hit a planet like the Earth. But if it could hit the Earth, it would have devastating consequences for life at the surface of the planet. If such an event did take place at this time, animals swimming in shallow seas would have died out almost immediately from the high radiation doses coupled by a sudden drop in world temperatures as nitrogen and oxygen atoms in the atmosphere broke apart by the radiation and later combined to form a thick fog of nitrous oxide compounds, thereby reducing sunlight from reaching the surface for several month (and so making it harder for plants to survive and insects to flourish). While those living in deeper waters would have a better chance of surviving. "The mega-tonnage would be like 100,000 megatons of nuclear bombs. It's like standing a couple of miles from a Hiroshima [atom] bomb everywhere on the surface of the Earth." At this distance, it should be enough to destroy nearly all life on the surface except for anything living deep underground and in the deep oceans. If the source of the GRB is only 100 light years away, the radiation would literally strip away the atmosphere, push the oceans apart to form massive tidal waves, and land masses would melt. Only bacteria in the very deepest oceans of the world may continue to survive. One thing in our favour is that our Milky Way is not a very old galaxy. Any of the bigger and/or older stars are more likely to be found closer to the centre of the galaxy compared to us lying more toward the edge of the galaxy. However, even at distances of 50,000 light years away, gamma ray bursts directed at Earth will have significant impact on how advanced life can survive. We have to be grateful for the rarity of such an event. Scientists put it down to a probability of roughly once every 350 to 500 million years based on current research into this field by a number of American astrophysicists in 2010. Very rare indeed, but it can happen. How would we fair if such an event were to take place today? Some scientists believe it would be enough to send humans back to the Dark Ages with much of our technology becoming worthless by the sudden surges in electrical current as the radiation hits the Earth. Then people will die from the radiation doses unless they were living in highly protected areas. Those who survive may have to burn books to keep warm, possibly fight for the food in the supermarkets and, if populations are sufficiently reduced, to scavenge for the remaining food, clothing and other resources generated by the previous profit-motivated society until the sunlight returns and people learn to go back to subsistence living and growing food on the land. No doubt a frightening scenario for those not prepared for such a potentially cataclysmic event. Whatever caused the extinction seem to have been short-lived. By 440 million years ago, plants grew once again to create a rich and diverse almost forested environment. At the same time, the level of oxygen in the atmosphere rose sufficiently for the Sun's powerful ultraviolet rays to convert a fraction of the oxygen into ozone in the upper atmosphere. Ozone is an important substance for it helps to shield living organisms from the harmful effects of ultraviolet light (a form of radiation considered by some scientists as one of the most important factors in shortening the lifespan of all living organisms as well as modifying the genes in DNA). Without ozone, life, especially for the animals, would probably not have reached out and made the first tentative steps on dry land.